The Sibelius Society of Finland has given the Sibelius Medal to Soile Isokoski in recognition of her outstanding artistic performances of the great Finnish composer's music. The award committee referred to Soile Isokoski's prize-winning recording of Luonnotar and orchestral songs with the Helsinki Philharmonic Orchestra and Leif Segerstam, which won the BBC Music Magazine's Disc of the Year 2007 Award, in addition to a 2007 MIDEM Classical Award as best vocal disc (ODE 1080-5). The medal was presented to the star soprano on December 6, 2007 - Finland's Day of Independence - following her performance of Sibelius's Kullervo at the Finlandia Hall in Helsinki. Further recipients of a Sibelius Medal in 2007 include conductor Jukka-Pekka Saraste and legendary baritone Jorma Hynninen, in addition to the founder and managing director of the recording label Ondine, Reijo Kiilunen. The Sibelius Society of Finland was founded on December 7, 1957 with the iinitial mission to have a monument erected in the Sibelius Park of Helsinki (unveiled in 1967). 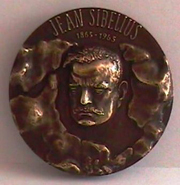 For the celebration of Sibelius's 100th birthday in 1965, the Sibelius Society organized the first International Jean Sibelius Violin Competition which has since been held every five years. In the same year, the first Sibelius Medal was given to Finland's President Urho Kekkonen. Recent recipients of the Medal have included conductors Leif Segerstam, Esa-Pekka Salonen and Osmo Vänskä (2005), as well as pianist Izumi Tateno (2006). For further information about the Sibelius Society of Finland, please visit its official website.